World Cup 2018: What Happened In The First Few Days If the first weekend's big matches had a lesson, it was that even great teams don't win every game. The Davids were stronger than expected, and the Goliaths were weighed down by sky-high expectations. 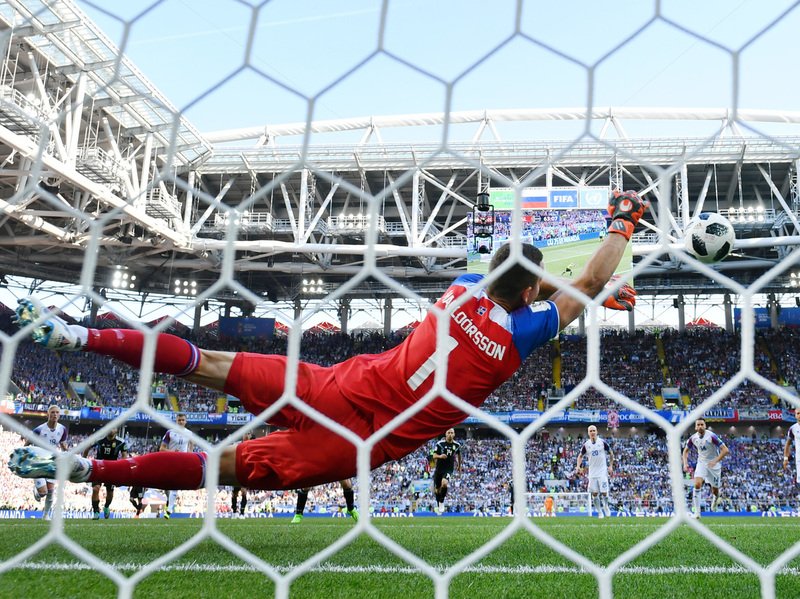 Hannes Halldorsson of Iceland saves a penalty kick by Lionel Messi of Argentina on Saturday in Moscow. Each team takes the pitch with fresh legs, ready to show whether its prospects have been over- or underrated. And if this weekend's biggest matches had one lesson, it was that even great teams don't win every game. The Davids showed themselves stronger than expected, and the Goliaths were sometimes weighed down by sky-high expectations. Case in point: World Cup rookie Iceland tied Argentina on Saturday, in what must have felt like a stunning loss for fans of Lionel Messi and La Albiceleste. Sergio Aguero of Argentina scored first, but Iceland soon equalized it. Then Argentina drew a penalty, and Messi stepped up. It seemed like Iceland's luck had run out. But then Messi fired his shot, and Hannes Halldorsson dove and blocked it in one of the tournament's most stunning moments so far. Iceland's football association reported that 99.6 percent of people watching TV in Iceland (pop. 330,000) during the match were tuned in to the game. The match was also reportedly the highest-rated English-language broadcast of the tournament in the U.S., too. Sunday brought two more surprises. Mexico beat Germany 1-0, after a goal in the 35th minute by 22-year-old Hirving Lozano. Germany, which won the Cup four years ago and is ranked No. 1 in the world, kept pushing but never scored. While such an outcome is rare for Die Mannschaft, Germans have a word for losing an opening game: Auftaktniederlage. And Brazil, along with Germany a favorite to win the whole thing, found itself with a disappointing 1-1 tie with Switzerland. The greatest match of the tournament so far was Friday's thrilling 3-3 draw between Spain and Portugal, featuring a hat trick by Ronaldo. Today's matches so far haven't brought such shocks, but they pave the way for exciting showdowns to come. Sweden beat South Korea 1-0 with a successful penalty kick. The most interesting part of the match was the spycraft that preceded it, with one of Sweden's coaches admitting he had been observing closed Korean practices, and the Korean manager revealing that he had made his players swap shirts during recent friendly matches to confuse their opponents. "They might know a few of our players but it is very difficult for Westerners to distinguish between Asians and that's why we did that," he told reporters. In the day's second match, Belgium took on Panama, which qualified for its first World Cup in part because of the U.S. team's disastrous loss to Trinidad and Tobago. Panama is ranked No. 55 in the world, while Belgium is ranked third. Leading into the match, Panama's coach kept expectations in check. "We've become strong on defense. It's Panama's virtue," Hernán Darío Gómez told reporters. "Panama isn't a team that will score a lot of goals. We may create good chances in some matches, but we aren't able to score. We arrive at the World Cup with problems scoring the goals." His assessment was accurate: Panama lost, 0-3, to Belgium. Two of Belgium's goals were scored by Romelu Lukaku: one a diving header, the other an artful chip over the keeper. It was a great showing by the Manchester United forward, who shared his story of growing up poor and black in Belgium in an essay yesterday for The Players Tribune. "I thought, Where am I from? What? I was born in Antwerp. I'm from Belgium." That questioning of his Belgianness has persisted in his professional career, he writes: "When things were going well, I was reading newspapers articles and they were calling me Romelu Lukaku, the Belgian striker. When things weren't going well, they were calling me Romelu Lukaku, the Belgian striker of Congolese descent." England takes on Tunisia in the last game today. Without the U.S. team in this World Cup, fans of the Yanks can cheer for any nation. Should the U.S. fans perhaps cheer for Mexico, since they are our neighbor, or against them because they are our rival? That question came to the fore when former U.S. star Landon Donovan, who now plays in the Mexican soccer league, appeared in an ad for Wells Fargo, encouraging U.S. fans to cheer for Mexico. "USA fans, our team may not be in Russia, but our neighbors to the south are. ... ¡Vamos México!" he tweeted, along with a photo of him holding a scarf that reads "My other team is Mexico." That didn't sit well with a number of his former teammates on the U.S. squad, including Cobi Jones, who is now a World Cup analyst for Fox. "Nah man!!! Mexico is not 'my team.' Mexico is a rival in CONCACAF. In sport there is something sacred about rivalries. Meaning and history behind them!!! I don't see Brazil cheering for Argentina. England cheering for Germany. Barca for Madrid ... It's sports and you're allowed to cheer against someone. Let alone your regional rival!!!" he wrote on Instagram. And in broadcasting, history was made on Friday: Aly Wagner, former member of the U.S. women's national team, called the Morocco v. Iran match for Fox, making her the first woman to call a men's World Cup match on U.S. television. On Monday evening, England won their opening World Cup game for the first time since 2006, with Captain Harry Kane scoring twice, giving the team a 2-1 victory over Tunisia. The game was a nail-biting victory for England, when player Harry Maguire deflected the ball to Kane, who headed it past keeper Farouk Ben Mustapha, and scored a second goal, winning the match.